When death comes to a family it’s a time for mourning and sorrow, but it can also be a time for a serene and joyful celebration of life. One of the most miraculous things found in nature is the metamorphosis of butterflies. The transformation from little caterpillar to beautiful butterfly is almost beyond explanation; inspiring awe in people for centuries and supporting their belief that a God is behind it. Ancient civilizations around the world have taken the magic of butterflies and made them symbols of the human soul. For many people, butterflies symbolize the spirit of the earth, representing beauty and freedom; when we connect with nature and butterflies we unconsciously feel peaceful and at harmony with the magical world around us. A funeral butterfly release is a wonderful – and visually beautiful – way to honor a recently departed loved one. A butterfly lights besides us like a sunbeam. And for a brief moment its glory and beauty belongs to the world. But then it flies once again, and though we wish it could have stayed, we feel so lucky to have seen it. As you release this butterfly in honor of me, know that I’m with you and will always be. Hold a hand, say a prayer, close your eyes and see me there. Although you may feel a bit torn apart, please know that I’ll be forever in your heart. Now fly away butterfly as high as you can go, I’m right there with you more than you know. If you’re interested in celebrating the life of a loved one by releasing butterflies at a funeral, contact us through this website. 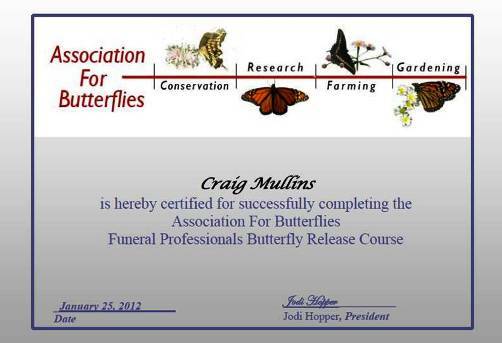 We are Butterfly Release Certified with the Association For Butterflies and look forward to helping you plan and arrange your funeral butterfly release. 1. The outside temperature should be at least 60 degrees Fahrenheit and there cannot be any rain. The butterflies won’t fly if the conditions are too cold. 2. The release of the butterflies should occur an hour before sundown. Butterflies in Mythology in relation to death…..
– Early Europeans believed that the human soul took the form of a butterfly so, they viewed the butterfly with great respect and often with fear. – In southern Germany, some say the dead are reborn as children who fly about as butterflies, resulting in the belief that they bring children. – The Irish believe that butterflies are the souls of the dead waiting to pass through purgatory. – The Maya looked upon butterflies also as the spirits of dead warriors in disguise descending to earth. – A dying man in the Solomon Islands has a choice as to what he will become at death and often chooses a butterfly. – Among the Nagas of Assam the dead are believed to go through a series of transformations in the underworld and are finally reborn as butterflies. – When the butterfly dies, that is the end of the soul forever. – The Aztecs believed that the happy dead in the form of beautiful butterflies would visit their relatives to assure them that all was well. This entry was posted on Monday, February 13th, 2012 at 9:28 PM	and is filed under Misc.. Both comments and pings are currently closed.